Place potatoes in a medium pot of cold, salted water, bring to a boil and cook until fully cooked, about 15 to 20 minutes. Drain, let cool slightly, and grate on a grater using the large holes. Heat 2 tablespoons oil or remaining bacon fat, in a large sauté pan over medium heat and add the onions. Season with salt and pepper and cook until golden brown and caramelized, stirring occasionally. Combine the diced tomatoes, red onion, jalapeno, cilantro, lime juice, olive oil, honey, salt and black pepper in a bowl and let sit at room temperature for at least 15 minutes before serving. Preheat the oven to 425°F. Place 4 tortillas on a work surface and top with cheese, hash browns, and bacon. Cover with 4 more tortillas to make 4 2-layer quesadillas. Brush the tops with oil and sprinkle with the ancho powder. Transfer the quesadillas to a large baking sheet and bake in the oven until golden brown and cheese has melted, approximately 8 to 10 minutes. Remove from the oven, and cut each quesadilla into quarters. Heat 2 tablespoons of the butter in a medium nonstick sauté pan until it begins to shimmer. Crack each egg into a ramekin and carefully slide into the pan (cook 4 at a time). Season with salt and pepper and cook until the white has set and the yolk is slightly firm; carefully flip over and continue cooking for another minute. 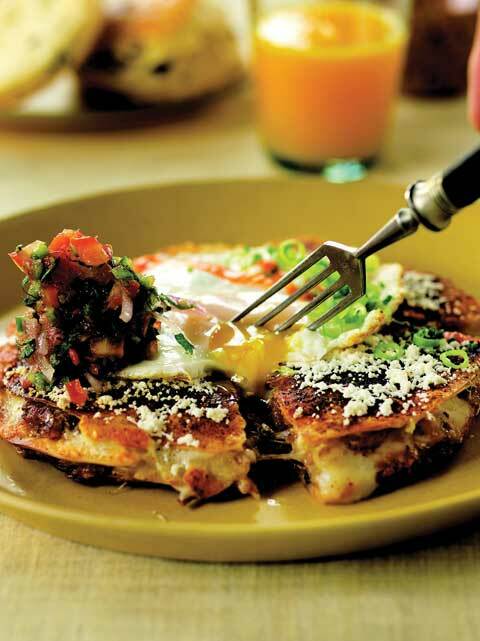 Top each quesadilla quarter with a fried quail egg and a few heaping tablespoons tomato relish. Garnish with chopped chives.